Your wedding day is one of the biggest events you’ll ever plan, which is why many couples want it to be absolutely perfect. What better way to ensure your wedding day is special than to say your vows while standing on a beach in paradise? Our Omaha travel agents at Enchanted Honeymoons will help you plan the destination wedding of your dreams in beautiful Mazatlan, Mexico. We can help you find the perfect resort at the right price, and also help you book the ideal venue for your destination wedding. Mazatlan, located on the Pacific Coast of Mexico, is a thriving commercial seaport with vibrant buildings and a stunning ocean view. You can enjoy the culture of the city, from delicious restaurants to local shops, or you can find a peaceful spot on the beach and immerse yourself in nature. Situated on the shore of the Pacific Ocean, Mazatlan enjoys spectacular sunsets over the water, creating a romantic atmosphere for you and your soon-to-be spouse. 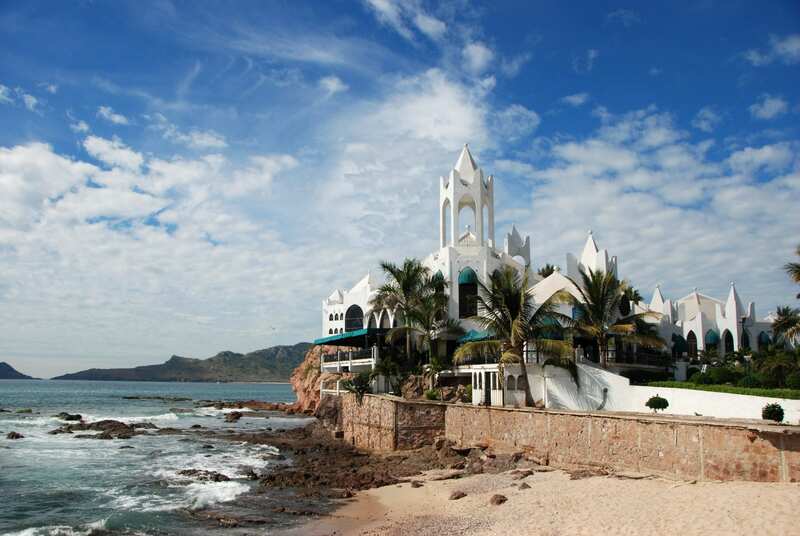 Mazatlan has plenty of great resorts to choose from for your wedding trip. Whether you’re looking for the most luxurious resort possible, or a resort that is fun for guests of all ages, you can find exactly what you’re looking for here in Mazatlan. All-inclusive resorts are the best way to enjoy your stay in Mazatlan, allowing you to focus on enjoying yourself and your wedding day. You can eat, drink, and be merry without worrying about additional expenses during your stay, since food, drinks, and resort entertainment are included in the cost of your stay. Mazatlan also has many adult-only resorts that are great for those who want an intimate and romantic destination wedding. Make it a wedding and honeymoon all in one with a relaxing getaway for you and your love. For those who would prefer to have family and friends with them for their big day, it may be important to stay at a family-friendly resort where guests of all ages are sure to have a great time. The best part about a destination wedding is getting to say your vows while your toes dig into the sand of an amazing beach. With all of the gorgeous beaches around Mazatlan, you’ll be sure to find the ideal venue for your dream wedding. In the city of Mazatlan you’ll be able to experience the interesting and beautiful culture which stems from multiple nationalities that have settled in the region. Old Mazatlan has great history and there are many outstanding restaurants where you can sample the local cuisine. Mazatlan has plenty of memorable activities to offer when you step outside of your resort, which makes it an unforgettable destination for your wedding and honeymoon. Plaza Machado is the cultural and historic center of Mazatlan, making it a must-see for all visitors. This plaza is full of character, regional music, craft vendors, and exquisite restaurants. Whether you’re looking for a place to spend an afternoon or an entire evening, Plaza Machado is a great destination. Old Mazatlan gives you a glimpse of what the city used to look like. It’s quaint and full of charm, making it a great place to walk around and explore. There are many excellent restaurants and cafes that offer traditional food, and plenty of shops where you can find a wonderful souvenir. Isla de Venados, or Deer Island, is an uninhabited island that is a perfect place to spend a sunny afternoon. Since there are no hotels, resorts, or restaurants, it’s a very private beach where you can relax in the sun or go on a snorkeling excursion. Be sure to try some fresh fruit cocktails and seafood sold by local vendors! Are you ready to book your dream wedding in the beautiful city of Mazatlan? Call Enchanted Honeymoons at 402-281-3022 to speak with a travel agent who will help make sure your wedding day is as special as can be. Learn more about Mazatlan wedding packages and travel options, and start planning your perfect day!